By the time the kids get home from school, they’re ready to kick back and relax with some tasty snacks that will tide them over until dinnertime. But they’re not the only exhausted ones. You’ve lived an entire day of your own, working, cleaning and preparing for their arrival. Sometimes you just want to give your kids something quick, simple and, of course, healthy. Here are a few tips for making snacks when you just don’t have the energy to whip up a four-course meal. Healthy snacks often don’t require any cooking, microwaving or preparation at all. At the beginning of the week, head to the grocery store and pick up large cases of peanuts, raisins, candy-coated chocolates and more to mix up a great trail mix. Trail mix is healthy and provides quick energy for your kids to get the boost they need to do their homework after school. Whipping up your own granola with honey, oats and the dried fruit of your choice will have the same effect. Taking care of snacks early in the week makes sure you’re prepared for the moments when even lifting a knife sounds painstaking. Plus, mooching off the snacks you prepared yourself will help boost your own energy level. We know what you’re thinking. “But there’s a ton of junk food in the freezer aisle!” There is, sure, but many frozen brands offer healthy, protein-rich options like frozen all-natural chicken fingers or small frozen meals that require little more than popping the snack in the microwave or oven. Take a look at the meal’s sodium content before buying. Often, freezer brands pack in salt as a preservative, but there are many reasonable brands on the market. Use your best judgment by looking at the nutritional information before you buy. There are plenty of products specifically designed for the wiped out mom. For example, around summertime you’ll find that stores carry plastic containers with sticks made for creating your own ice pops. Thinking ahead of time at the beginning of the week, fill the molds with pudding, yogurt, fruit, juice and more for fun, portion-controlled snacks that keep kids cool in the summer months. Older kids can make their own snacks, so dole out the duties as part of their chores. 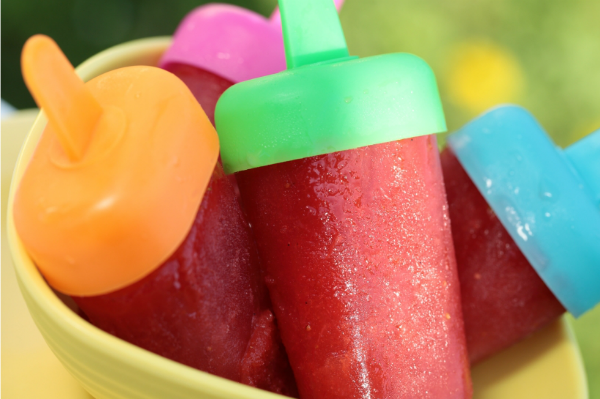 Have them create their own fun ice pop concoctions, mix up some trail mix or heat up frozen treats for the younger ones. Utilize all of the work power you have around you.